A pedestrian was fatally hit by a box truck in New York City yesterday morning. 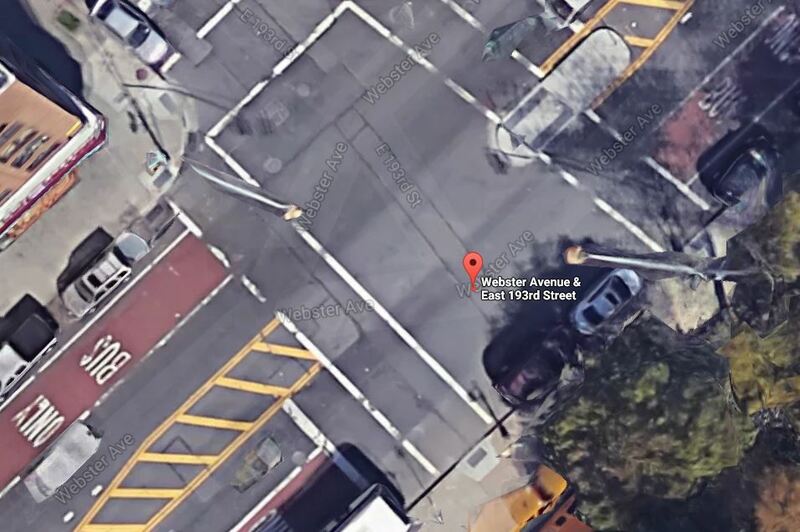 The 60 year old man was crossing the intersection of Webster Avenue and East 193rd Street around 7:12 am when he was struck by a box truck. According to the police, the truck driver was waiting for the light at the intersection. When the light turned green he accelerated and fatally hit the pedestrian. He remained at the scene of the accident and wasn’t arrested. The pedestrian died at the scene of the accident. The police are still investigating. The intersection is very large and very dangerous with a history of accidents. According to the Vision Zero map, since 2009, 6 pedestrians, 3 cyclists and 26 motorists were injured in accidents at this spot. In 2009, 1 pedestrian, 1 cyclists and 4 motorists were injured in accidents at this location. In 2010, another pedestrian was injured. In 2011, 9 motorists, 1 cyclist and 2 pedestrians suffered personal injury at this dangerous intersection. In 2012, again 2 pedestrians, 1 cyclist and 2 motorists were injured. In 2014, 2 motorists were injured. Another motorist and a pedestrian were injured in 2015. Last year an additional pedestrian was hurt as well as 3 motorists. So far this year 5 motorists were injured in crashes at this particular location.